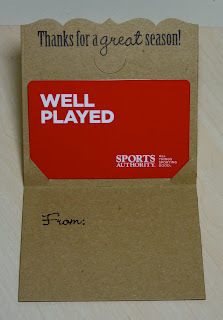 Here's a really simple gift card holder that I made for Eric's basketball coaches. Things are a little crazy around here, so I was very happy to have the My Creative Time Embossed Gift Card Holder die to whip up three of these quickly! I took a 2 1/4" x 3 1/4" piece of patterned paper from the Teresa Collins Sports Edition II collection. On top of it I heat embossed with black embossing powder "Slam Dunk!" 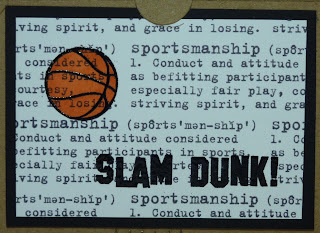 and the basketball image from the My Creative Time Slam Dunk stamp set. I love how the orange Copic marker on the basketball image still lets the writing show through. The black layer underneath is 2 1/2" x 3 1/2". "Thanks for a great season!" is from My Creative Time's Sport Sentiments stamp set. This is a must-have set if you have athletes in your life! The "From" on the inside is from My Creative Time's Gift Card Sentiments stamp set. The perfect little packaging for a Sports Authority gift card! Very nice and quick too! Great combo! This is awesome Katie! Love the embossing it's so cool around the basketball!! Sniff, sniff I wished I had someone to make one for! Maybe some of my friends kids will need one for their coach!! LOVE LOVE LOVE!!! So creative.. Super cute. They are sure to,love these. 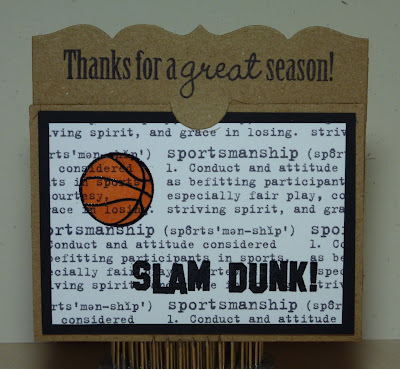 Katie ~ I LOVE how you embossed but the basketball is way too COOL! Great background papers too! LOVE the definition idea! The coaches will LOVE these ~ so spot on for them!